On May 6th, Family Tree DNA released myOrigins as a free feature of their Family Finder autosomal DNA test. This autosomal biogeographic feature was previously called Population Finder. It has not just been renamed, but entirely reworked. 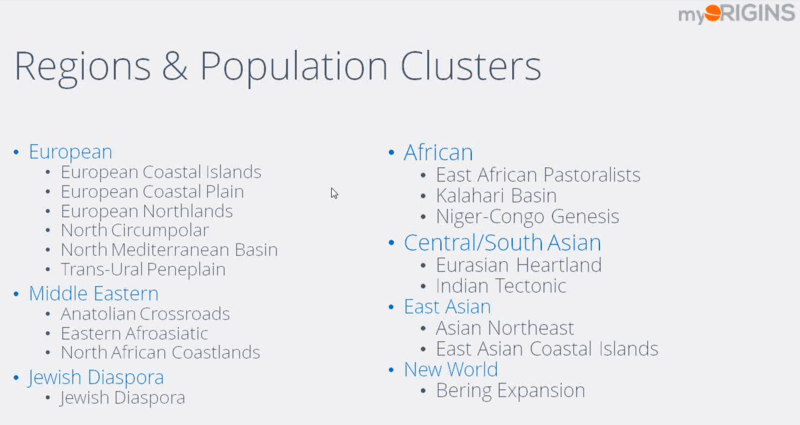 Currently, 22 population clusters in 7 major geographic groups are utilized to evaluate your biogeographic ethnicity or ancestry as compared to these groups, many of which are quite ancient. Each of these groups has an explanation which can be found here. Prior to release, Family Tree DNA sent out a notification about new matching options. One of the new features is that you will be able to see the matching regions of the people you match – meaning your populations in common. This powerful feature lets you see matches who are similar which can be extremely useful when searching for minority admixture, for example. However, some participants don’t want their matches to be able to see their ethnicity, so everyone was given an ‘opt out’ option. Fortunately, few people have opted out, less than 1%. Be aware that only your primary matches are shown. This means that your 4-5th cousins or more distant are not shown as ethnicity matches. Select the “Do not share my ethnic breakdown with my matches. This will not let me compare my ethnicity with my matches.” radio button. You can get more details about what will be shared here. You may also join our forums for discussion. * You can change your privacy settings at any time. Thus, you may opt-out of or opt back into ethnic sharing at a later date if you change your mind. Let’s take a look at the My Origins results. You can see your results by clicking on “My Origins” on the Family Finder tab on your personal page at Family Tree DNA. Your population ethnicity is shown on the main page, as well as up to three shared regions that you share with your matches. This means that if you share more than 3 regions with these people, the 4th one (or 5th or 6th, etc.) won’t show. This also means that if your match has an ethnicity you don’t have, that won’t show either. Above, you see my main results page. Please note that this map is what is known as a heat map. This means that the darkest, or hottest, areas are where my highest percentages are found. Each region has a breakdown that can be seen by clicking on the region bar. 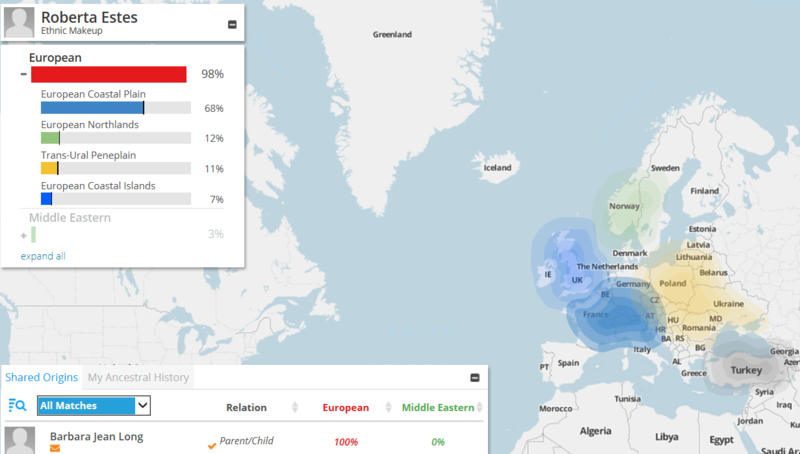 My European region bar population cluster breakdown is shown below along with my ethnicity match to my mother. And my Middle Eastern breakdown is shown below. 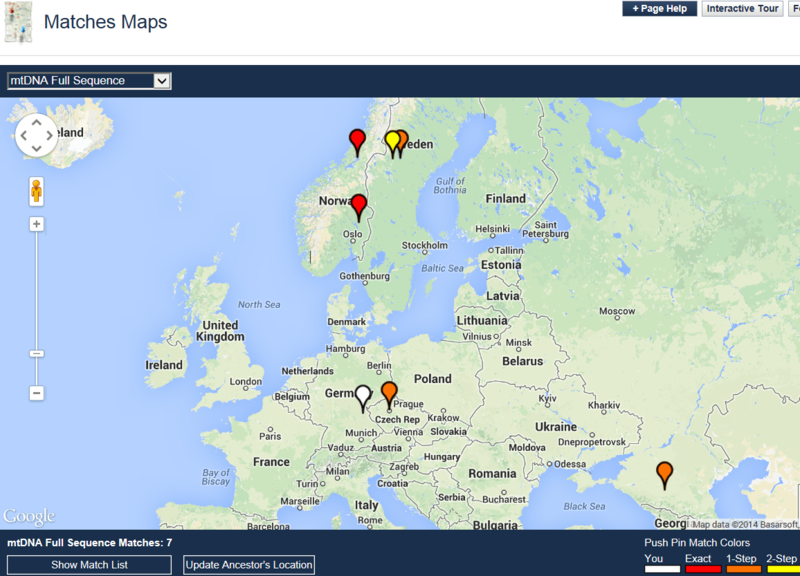 A great new feature is the mapping of the maternal and paternal ethnicity of your Family Finder matches, when known. How does Family Tree DNA know? The location data entered in the “Matches Map” location field. Can’t remember if you completed these fields? It’s easy to take a look and see. 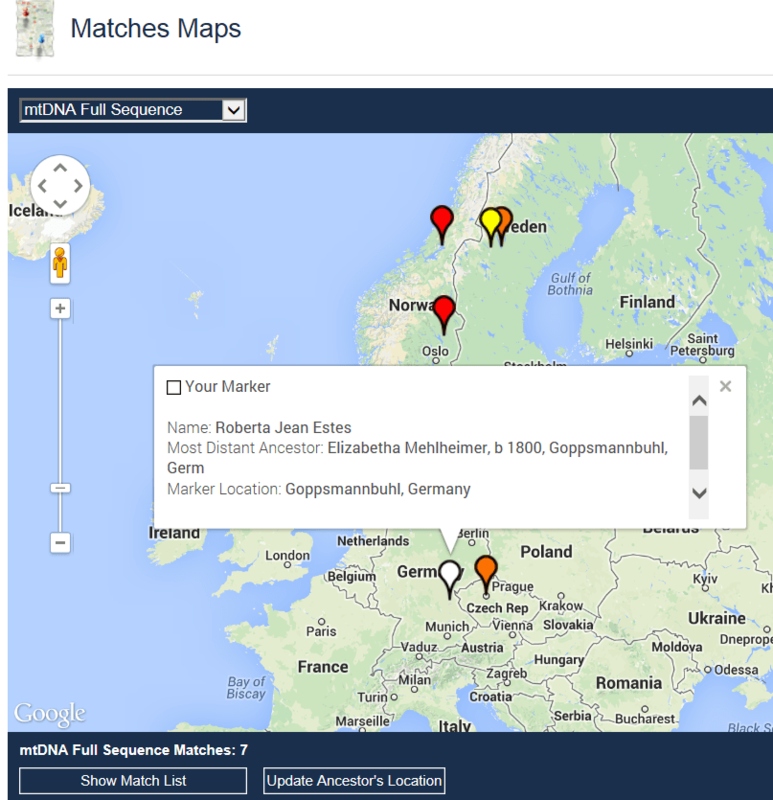 On either the Y DNA or the mtDNA tabs, click on Matches Map and you’ll see your white balloon. If the white balloon is in the location of your most distant ancestor in your paternal line (for Y) or your matrilineal line for mtDNA (your mother’s mother’s mother’s line on up the tree until you run out of mothers), then you’ve entered the location data and you’re good to go. If your white balloon is on the equator, click on the tab at the bottom of the map that says “update ancestor’s location” and step through the questions. If you haven’t completed this information, please do. It makes the experience much more robust for everyone. 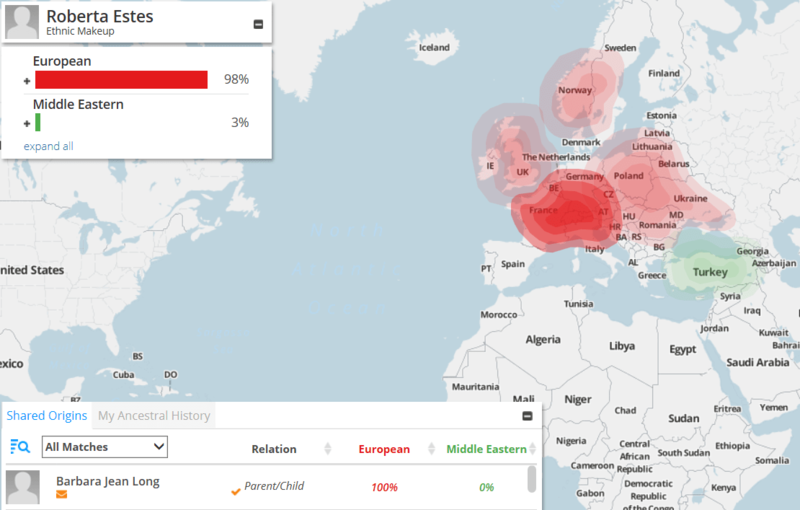 The buttons to the far right of the page show the mapped locations of the oldest paternal lines and the oldest matrilineal (mtDNA) lines of your matches. Direct paternal matches would of course be surname matches, but only to their direct paternal lines. This does not take into account all of their “most distant ancestors,” just the direct paternal ones. This is the yellow button. The green button provides the direct maternal matches. Do not confuse this with your Matches Map for your own paternal (if you’re a male) or mitochondrial matches. Just to illustrate the difference, here is my own direct maternal full sequence matches map, available on my mtDNA tab. As you can see, they are very different and convey very different information for you. By way of comparison, here are my mother’s myOrigins results. Let’s say I want to see who else matches her from Germany where our most distant mitochondrial DNA ancestor is located. I can expand the map by scrolling or using the + and – keys, and click on any of the balloons. Indeed, here is my balloon, right where it should be, and the 97% European match to my mother pops up right beside my balloon. The matches are not broken down beyond region. This is full screen, so just hit the back button or the link in the upper right hand corner that says “back to FTDNA” to return to your personal page. Family Tree DNA has provided a walk-through of the new features. How did Family Tree DNA come up with these new regional and population cluster matches? As we know, all of humanity came originally from Africa, and all of humanity that settled outside of Africa came through the Middle East. People left the Middle East in groups, it would appear, and lived as isolated populations for some time in different parts of the world. As they did, they developed mutations that are found only in that region, or are found much more frequently in that region as opposed to elsewhere. Patterns of mutations like this are established, and when one of us matches those patterns, it’s determined that we have ancestry, either recent or perhaps ancient, from that region of the world. The key to this puzzle is to find enough differentiation to be able to isolate or identify one group from another. Of course, the groups eventually interbred, at least most of them did, which makes this even more challenging. MyOrigins attempts to reduce the wild complexity of your genealogy to the major historical-genetic themes which arc through the life of our species since its emergence 100,000 years ago on the plains of Africa. Each of our 22 clusters describe a vivid and critical color on the palette from which history has drawn the brushstrokes which form the complexity that is your own genome. Though we are all different and distinct, we are also drawn from the same fundamental elements. The explanatory narratives in myOrigins attempt to shed some detailed light upon each of the threads which we have highlighted in your genetic code. Though the discrete elements are common to all humans, the weight you give to each element is unique to you. Each individual therefore receives a narrative fabric tailored to their own personal history, a story stitched together from bits of DNA. They have also provided a white paper about their methodology that provides more information. After reading both of these documents, I much prefer the explanations provided for each cluster in the white paper over the shorter population cluster paper. The longer version breaks the history down into relevant pieces and describes the earliest history and migrations of the various groups. I was pleased to see the methodology that they used and that four different reference data bases were utilized. Given this wealth of resources, I was very surprised to see how few members of some references populations were utilized. In particular, the areas of France, Germany, Norway, Slovakia, Denmark and the Ukraine appear to be very under-represented, especially given Family Tree DNA’s very heavy European-origin customer base . I would hope that one of the priorities would be to expand this reference data base substantially. Furthermore, I don’t see any New World references included here which calls into question Native American ancestry. How did they do? Certainly, Family Tree DNA has a great new interface with wonderful new maps and comparison features. Let’s take a look at accuracy and see if everything makes sense. I am fortunate to have the DNA of one of my parents, my mother. In the chart below, I’m comparing that result and inferring my father’s results by subtracting mine from my mother’s. This may not be entirely accurate, because this presumes I received the full amount of that ethnicity from my mother, and that is probably not accurate – but – it’s the best I can do under the circumstances. It’s safe to say that my father has a minimum of this amount of that particular population category and may have more. *The Undetermined category is not from Family Tree DNA, but is the percentage of my father not accounted for by inference. This 40% is DNA that I did not inherit if it falls into a different category. Based on these results alone, I have the following observations. I find it odd that my mother has 34% North Mediterranean and I have none. We have no known ancestry from this region. My mother does have one distant line of Turkish DNA via France. I have presumed that my Middle Eastern (now Anatolia and Caucus) was through that line, but these results suggest otherwise. My mother’s Circumpolar may be Native American. She does have proven Native lines (Micmac) through the Acadian families. These results have missed both my Native lines (through both parents) and my African admixture although both are small percentages. The European Coastal Plain is one of the groups that covers nearly all of Europe. Given that my mother is 3/4th Dutch/German, with the balance being Acadian, Native and English, one would expect her to have significantly more, especially given my high percentage. The European Coastal Island percentages are very different for me and my mother, with me carrying much less than my mother. This is curious, because she is 3/4th German/Dutch with between 1/8th and 3/16th English while my father’s lines are heavily UK. My father’s ancestry may well be reflected in European Coastal Plain which covers a great deal of territory. All of the biogeographic tools, from Family Tree DNA, 23andMe and Ancestry, are “estimates” and each of the tools from the three major vendors rend different results. Each one is using different combinations of reference populations, so this really isn’t surprising. Hopefully, as the various companies increase their population references and the size of their reference data bases, the results will increasingly mesh from company to company. These results are only as good as the back end tools and the DNA that you randomly inherited from your ancestors. Furthermore, we all carry far more similar DNA than different DNA, so it’s extremely difficult to make judgment calls based on ranges. Europe, for example, is extremely admixed and the US is moreso. The British Isles were a destination location for many groups over thousands of years. Some of the DNA being picked up by these tests may indeed be very ancient and may cause us to wonder where it came from. In future test versions, this may be more perfectly refined. There is no way to gauge “ancient” DNA, like from the Middle East Diaspora, from more contemporary DNA, only a thousand years or so old, once it’s in very small segments. In other words, it’s all very individual and personal and pretty much cast in warm jello. We’ve come a long way, but we aren’t “there” yet. However, without these tools and the vendors working to make them better, we’ll never get “there,” so keep that in mind. While this makes great conversation today, and there is no question about accuracy in terms of majority ancestry/ethnicity, no one should make any sweeping conclusions based on this information. This is not “cast in concrete” in the same way as Y DNA and mitochondrial haplogroups and STR markers. Those are irrefutable – while biogeographical ethnicity remains a bit ethereal. In summary, I would simply say that this tool can provide great hints and tips, especially the matching, which is unique, but it can’t disprove anything. The absence of minority admixture, which is what so many people are hunting for, may be the result of the various data bases and the infancy of the science itself, and not the absence of admixture. My recommendation would be to utilize all three biogeographic admixture products as well as the free tools in the Admixture category at GedMatch. Look for consistency in results between the tools. I discussed this methodology in “The Autosomal Me” series. I asked Dr. David Mittelman, Chief Scientific Officer, at Family Tree DNA about the reference populations. He indicated that he agreed that some of their reference populations are small and they are actively working to increase them. He also stated that it is important to note that Family Tree DNA prioritized accuracy over false positives so they definitely took a conservative approach. This entry was posted in Admixture, Anthropology, Autosomal, Data Bases, Ethnicity, Family Finder, Family Tree DNA, GedMatch, Migration, myOrigins, Population Genetics and tagged Introductory DNA by Roberta Estes. Bookmark the permalink. Thanks for explain how the origins are calculated and how few it is that are in the reference population for statistics, The selection is also not random it is the people who are willing to pay 100 dollar or more to be a member of the reference population. I believe the only people who pay are the people from the Family Tree data base. I believe the rest do not pay to be included, but I’m not entirely positive. Anyone with a long line of ancestors from Scotland and Yorkshire and even Ireland are going to (probably) show European Northland ancestry. Circumpolar my be an indicator of Native American ancestry? I mean because you are fairly certain of your mother’s Native American dodumentation….. If you read the definition of Circumpolar in the white paper, you’ll note that it states it covers a broad region, even into the New World. My mother does have documented Native ancestry through the Acadian lines in Nova Scotia. This is documented by DNA haplogroups as well as in some records. My results are – shall we say unexpected – considering my fairly robust family tree. I have European Northlands 25% (Swedish grandfather – makes sense); North Circumpolar 4% (I seem to have a fair number for triangulated Finnish DNA cousins with no MRCA so I suspect there is a Finnish grandmother somewhere); then European Coastal Plain 68% and European Coastal Islands 3%??? Out of 16 great grandparents, one is German/Swiss, but 6 go back to Colonial New England. A few Dutch and French in the mix but mostly English, or so I thought. Of the rest, most are Irish, Scottish and recent English. Ancestry said I had mostly Viking ancestors. Does this mean they were Saxons and Normans instead? All ethnic predictions to be taken with a BIG grain of salt. About France, you have to know that to test its own dna is…. not legal ! That is why so few French people tried it. Few of them have heard about dna testing (companies don’t communicate because testing is not legal). We are a few to have overpassed. I really LIKED this explanation! Thanks! Roberta – Thanks for this great post. I’ve encouraged people to read your article from my own site this morning. Overall, I’m disappointed with myOrigins, but I do see some potential benefits. The two Brazilian tribes used as New World references are just not enough, so I’m holding out hope that once they broaden their reference populations database, that the percentage figures will more accurately reflect the diverse ancestry of those of us with entirely colonial American roots. I see no benefit to myOrigins at all. Family Tree DNA has totally missed the boat with my family. I have a well-documented tree that has largely been confirmed thru DNA testing. My ancestry is mostly from the British Isles, but myOrigins has me with 0%, even though it shows my father with British Isles ancestry. But it shows my father with no ancestry in European Coastal Plain even though he has proven ancestry in France and Germany (he has more than 25% German ancestry). It shows both of us with European Northlands even though we have no Scandinavian ancestry. Also, on the Y-DNA side, our ancestry went from Spain to England, but myOrigins shows me with no English or Spanish ancestry. I have found the Gedmatch utilities to be by far the most accurate for admixture, with Ancestry.com being second best (I cannot test with 23andMe, so I cannot comment on that). As I’ve tested with all three major companies, and each so different one from another, that IMHO one must receive them all with a grain of salt. Even with GEDmatch, there are several different admixture methodologies, depending on the creator, such Dienekes’ Dodecad, which has several itself based on the number of reference populations. At this stage of the science, I think everyone’s still reading tea leaves. The future will depend on a greatly enlarged database of reliable and genealogically relevant population reference samples. As usual Roberta you provide a salient summary of the latest genetic genealogy developments. One aspect of myOrigins confuses me. You say “A great new feature is the mapping of the maternal and paternal ethnicity of your Family Finder matches…” but I’m unclear what relevance a particular tester’s personal direct maternal or paternal lineage might have for their autosomal matches with whom they share no immediate family ties. You are right in that the matches may not be relevant to you. But they also may be. If you see someone who has a balloon in the area where your ancestors were from, that bears checking out. It’s just another possible clue. 23andme gives me 99% European and 1% Anatolia……but 23nadme state it only goes back 500 years from today, so my question is ……how far back does myOrigins cover? This is very helpful, Roberta. Thank you very much for posting it. FTDNA should put this info on the explanation of each cluster on each person’s map page. Question – Since we all know specific DNA is in effect “diluted” the further one goes back in time… does this imply my 4% North Circumpolar would carry a lot more “weight” than say if I had 4% of European Coastal Plain? Hi Tom, No, 4% is 4% no matter what it is, unless I’m misunderstanding your question. If these ranges from Dr. Mittelman are accurate, then it makes little sense to tie genealogy to MyOrigins. If someone can’t find that 11% of a Scandinavian ancestor, then its because records simply don’t trace back 3-5K years ago. Correct? All we can say is that an ancestor may have come from Scandinavia that long ago, but from a contemporary standpoint, it is irrelevant. Hi Chip. You’re right, it might be irrelevant from a genealogy standpoint, but it might not be too. We don’t know if or when they moved on. I view most of the ethnicity results from all of the companies as interesting. Roberta, please explain what K means so that I’m not misunderstanding it. Thanks! K means 1000. So 5-10 K means 5000-10,000 years. The “Matches Map” doesn’t work on mine and I’m assuming it’s something you only get with an upgrade to testing. I transferred over Geno 2.0 results and then transferred over 23andMe when they were having a Family Finder sale a while back. The matches map is only if you have tested your actual marker values – meaning the 12, 25, 37, 67 or 111 markers. It also works for mtdna if you have taken any of those tests. Hello, i’d like to inquire, which reference group is eastern afroasiatic based on? It seems quite strange that Iranians would score quite high on this. This is a question i’ve had for a long time. This actually doesn’t tell me anything about the reference groups used for it. It gives a hypothetical coalescence of the admixture. The sources, mention the levant and the arabia, but not what populations are used for the actual admixture component. You may want to ask Family Tree DNA for this information. Where iraqis, kuwaitis and saudis used for it? What shows up for Amerindian in Dodecad globe13 and Eurogenes K13 is similar to what used to show up in Pop Finder and it is also similar to what shows up in AncestryDNA. MyOrigins is a different story. 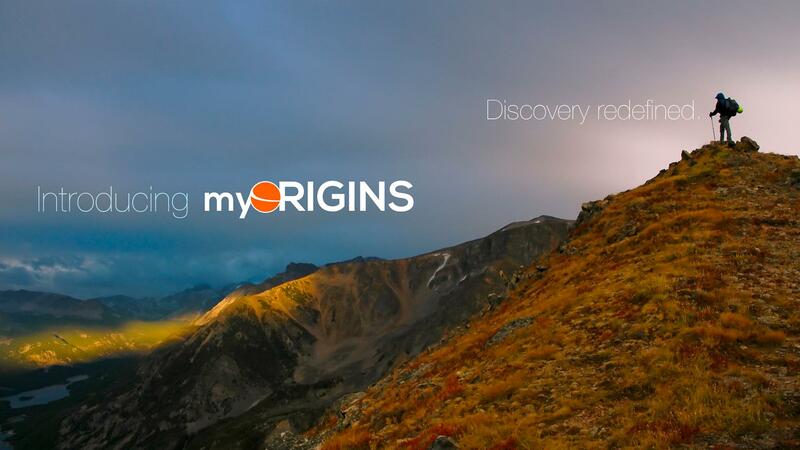 MyOrigins breaks up the Native American ancestry of Latin Americans into New World, East Asian, and North Circumpolar. The largest amount goes to New World, a much smaller amount goes to East Asian, and an even smaller amount goes to North Circumpolar. If you have a detectable amount of Native American ancestry you should see it in Eurogenes K13 calculator at Gedmatch, Dodecad globe13 calculator http://www.y-str.org/2013/07/diy-dodecad-21-wrapper.html, or AncestryDNA. I assume that anybody that only has 3% Native American detected elsewhere won’t see it in myOrigins. Roberta, the way you attempted to calculate the inferred amount of ancestry of your father was done wrong. You can’t subtract your total from your mother’s total to infer your father’s total. Actually there is no accurate way to calculate the amount using what myOrigins has given you. There is a way to infer amounts based on what can be found with Dodecad globe13 or Eurogenes K13. I’ll explain using amounts from a family that is willing to share their results. 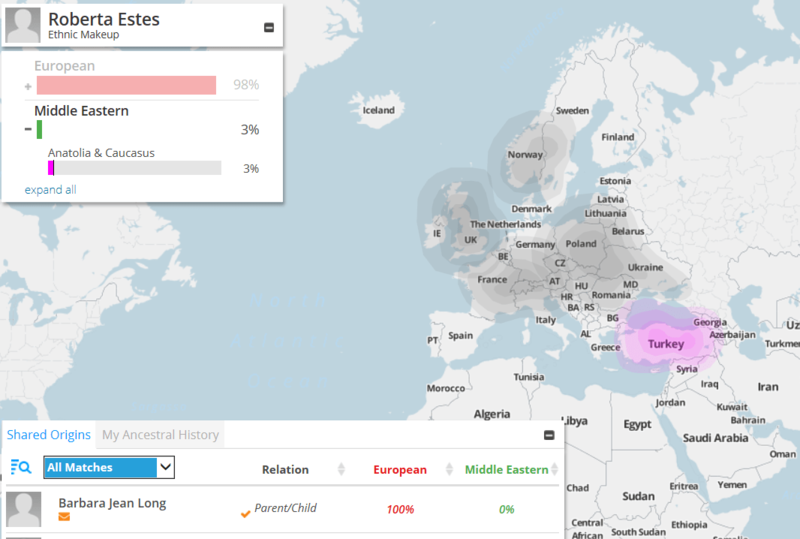 In myOrigins the father is 65% European, 21% New World, 8% East Asian, and 6% Middle Eastern. The mother is 73% European and 26% Middle Eastern. The child is 79% European, 7% Middle Eastern, 10% New World, and 3% East Asian. See how you can’t subtract the amount of the child from the amount of the mother to get the father’s amount? That same family in Dodecad globe13 has the following. The father is 24% North European, 30% Mediterranean, 30% Amerindian, 4% Southwest Asian, 2% West Asian, and 10% a mix of other components. The mother is 39% North European, 34% Mediterranean, 16% West Asian, 8% Southwest Asian, and 3% other. The child is 31% North European, 34% Mediterranean, 14% Amerindian, 8% West Asian, 6% Southwest Asian and 7% other. If you notice the child is close to one half the total of the two parents. Example 24% North European + 39% North European=63%. 63% North European/2=31% which is what the child inherited. If only one parent has a component such as Amerindian then the child inherits almost exactly one half the total. Example 30% Amerindian divided by 2 is 15%. The child inherited 14%. Now let’s apply that to you. If you run your mother’s raw file and your raw file through Dodecad globe13 and then divide all of your mother’s results by two that is close to how much of her Autosomal DNA that you have. Now subtract the halved amount of your mother’s components from your amounts and that is how much you have inherited from your father. Now multiply each of those amounts by two which will give you close to what your father had. It’s a simple process really. Unfortunately it won’t give you the places of ancestry of your father but it will show if he had a high level of one of the components or if he is close to the European populations in the Dodecad spreadsheet. I said in the verbiage that I realized that I had not obtained all of my mother’s heritage, and that my father’s would be the inferred amount or more. I also know that I didn’t receive exactly half of my mother’s – some times less and sometimes more. I worked through this extensively in “The Autosomal Me” series that I did. I have utilized the various GedMatch tools and they are great. The point was that you can’t infer your father’s amount based on the results of you and your mother from myOrigins. Stating that “I realized that I had not obtained all of my mother’s heritage, and that my father’s would be the inferred amount or more” doesn’t help to explain the huge differences between the real world example that I provided and what I would get using your math. Please provide a mathematical equation to explain the amounts using the real world example I gave you of two parents and a child? You won’t be able to because no mathematical calculation can be used to explain the results of the child based on the parents. Likewise, the results of one of the parents based on the child and the other parent can’t be explained by using the math you are using or by any other mathematical equation. What mathematical equation can explain the real world example of the father being 65% European, the mother 73% and the child 79% European? Using your math I would have said that the father is 6% European. There is a huge difference between your calculated 6% and the real world 65%. The difference is so large it is meaningless to a person to know that the unknown amount of a parent could be anywhere from 6% to 65%. Another thing is your mother’s North Mediterranean that you didn’t inherit. You should be able to calculate that into your results and you should have close to half your mother’s results. Your math doesn’t work for that either. The math simply does not work for the results of myOrigins. It is futile to try and infer amounts based on a child and one parent from the results of myOrigins and every reader should understand this. I found your blog post on the gedmatch tools but it was before the newer Eurogenes K13 was released and you didn’t include your mother’s results in the blog post when you included your Eurogenes K9 results. You used a much older Dodecad which was V3. The latest is globe13. http://dna-explained.com/2013/03/03/the-autosomal-me-rooting-around-in-the-weeds-using-third-party-tools/. Will you do us the favor of using Eurogenes K9 or K13 with your file and your mother’s file and post your results? You will see that my math makes more sense. The numbers aren’t as close with Eurogenes as they are with Dodecad globe13 but they are a whole lot closer than they are with myOrigins. Hi Armando. The point of this article was not to determine my father’s origins, but to do a quick calculation to see if the myOrigins results made sense by utilizing both my and my mother’s results. As you have pointed out, in some cases, they don’t. I don’t intend to redo “The Autosomal Me” series with updated software. That was intended to be a roadmap for people to be able to follow for their own purposes. I am very glad to see the new software both at the vendors and at GedMatch, and I may well do an article shortly comparing the three primary vendors and the GedMatch tools. As you know, this isn’t the easiest thing in the world because of the vast differences in nomenclature and trying to figure out what is an apple and an apple instead of a pear. It seems in myorigins my family and myself lost how much percentage of Native American we were in the older results. For example my grandmother was 51.31% Native American and now it says she is 36%. How did she lose so much of her percentage? My family lines on my father’s side both come from Mexico when I tested his lines in the old test under population it said Maya. I would like to what tribe I come, and the myorigins just confuse me. The autosomal SNP markers that would have been assigned to Native American are now assigned to Northeast Asian and Northern Siberia. Look for those in your results and add them to the Native American in myOrigins. I have a question…I had the ethnicity DNA test done at Ancestry, can that be used in your program? First, I don’t have a program. I’m simply a blogger. However, if you are asking about Family Tree DNA, if your test was done before mid May this year, yes you can transfer the kit for $39. However, in mid-May ancestry changed chips and it’s no longer compatible with Family Tree DNA, so from mid-May forward, no. My MyOrigins results are SO boring! 71% W&C Europe and 29% Scandinavia!